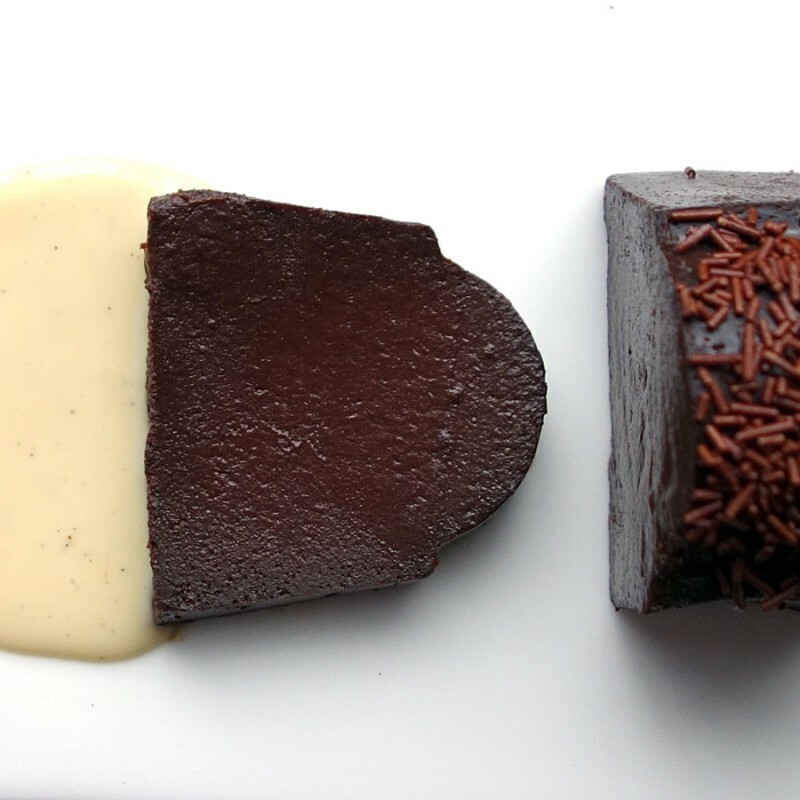 A dense chocolate flan covered with chocolate sprinkles and served with crème anglaise. From Brazil, it resembles the famous Brigadeiros chocolate candy balls. Butter a 9” ring pan and place it in a larger pan to prepare it for a water bath. Sift the cocoa powder, cornstarch, sugar, and salt into a large bowl. In a medium bowl, with a whisk, beat the eggs with both of the milks, butter and vanilla. Slowly whisk the egg mixture into the cocoa mixture until it’s smooth. Pour the flan mixture into the prepared pan and add hot water in outside pan to reach about an inch up the side of the pan. Carefully, place flan in the oven. Bake for 45 minutes. Carefully, remove the flan from the oven and the water bath and cool on a rack for about 30 minutes. Place in the flan in the refrigerator for at least 4 hours until it’s completely chilled. To serve, warm bottom of the pan by dipping it in a container of hot water, then wipe it dry and invert the pan on a serving dish. Tap the pan gently to release the flan. Cover the top of the flan with chocolate sprinkles. Serve with crème anglaise on the side.